I was eager to jump right into reading Greed, because I absolutely loved the first book in the series, Vain, by Fisher Amelie. Spencer was one of Sophie Price's wealthy friends that we were introduced to in her story. As a matter of fact, he was the only friend of Sophie's that I liked, before she had her transformation. I was so excited to learn more about Spencer (Spence) and read his story. Greed is soley told from Spence's point of view. Spence attends Brown, is popular, wealthy, and has the world at his fingertips. However, he lives a miserable existence. He doesn't have any real friends. People use him for his money, and his father uses him as his lackey to do his bidding. Spencer can't stand to look at himself in the mirror. He disgusts himself with the lengths that he is willing to go, in order to get large sums of money from his father. Spencer despises his father, and is saving up, so that he can disappear and leave, but not until he acquires enough money to continue to live the lifestyle that he has grown accustomed to. A lifestyle that includes the most expensive cars, designer clothing, the most beautiful women, and anything that he wants getting delivered to him at the snap of his fingers. Spencer is very close to his younger, and beautiful, 17 year old sister Bridget (Bridge). He loves his mother, but knows that she is weak, and will never leave his father. There is an immediate and breathtaking attraction between Spencer and Cricket, but Spence quickly learns that she is taken, and her boyfriend Ethan Moonsong makes sure Spence knows it! While on the ranch, Spencer learns what hard work is when he's laboring from dusk till dawn with Jonah, Cricket, Ethan and the other workers. He also learns about the beauty of close family, friends, and community. Bridge and Spence begin to make a home at Hunt Ranch, and become happier than they've ever been in their lives. Unfortunately, a dark cloud lurks, as their father goes through great lengths to find them. Also, the closer that Spencer and Cricket get, the more anguish Spencer suffers from falling for a woman he can't have. Cricket has her own secrets, and Spencer is determined to figure them out. Bridget is falling in love with Jonah, but knows that it would never work out, because she is pregnant with another man's child. Greed was such a wonderful story. It had friendship, love, romance, mystery, angst, and suspense. I smiled, I cried, and I cheered on Spencer and Cricket, as well as Bridget and Jonah! My heart broke, and my heart soared in happiness! Fans of the Lost and Found Series by Nicole Williams will enjoy Greed. This story had warmth, family, a close community, friendship, and that same small town feel. Check out this series for excellent character driven stories, with heart, compassion, healing, and transformation. They also have a good dose of romance intertwined with breathtaking love stories! If you are looking for stories with substance, angst, and romance, check out Greed by Fisher Amelie. The first half of this story was a bit slow moving, but the second half took off, and completely had me hooked. I enjoyed watching Spencer grow as a character. The transformation was beautiful and believable. Cricket, and her family were instrumental to Spence becoming wiser, and learning what was important in life. Cricket was such a lively, spirited, and beautiful character as well. I loved her approach to life, and her good hearted nature was what Spence needed in his life at that moment. The slow building friendship, romance, and love that blossomed between Spencer and Cricket completely captivated me. 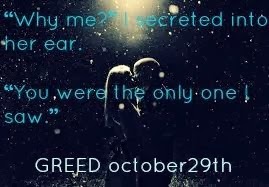 Greed was such a heartfelt, and beautiful love story, with many great messages and life lessons. I give Greed, by Fisher Amelie, 4 Heartfelt, Warm, Romantic, Healing, and Love Blossoming Filled Stars! I would have to say out of the seven deadly sins Idle intrigues me the most. Greed - I don't get why people would turn on their families for money, greed has always been a mystery to me. It's not worth it. Lust intrigues me the most. HAHA. I've been so excited for this book to come out. I loved Vain. It was so different and not at all what I was expecting when I started the book. Thanks for the giveaway! Lust would the sin that intrigues me most. That's why I read so much, LOL! Lust! Ha, okay I have to admit Binge is pretty interesting too but I'm sticking with Lust! Fury, I have a bad temper LOL and Binge because I love food, that would be my sin. Gluttony :) or Greed so this particular book! Great review you have me really excited to start this series! I really enjoyed Vain, too, and have been curious about Greed. I love the setting, and the comparison to Lost & Found has me sold! I just cant wait for Fury! Fury intrigues me the most, thanks!